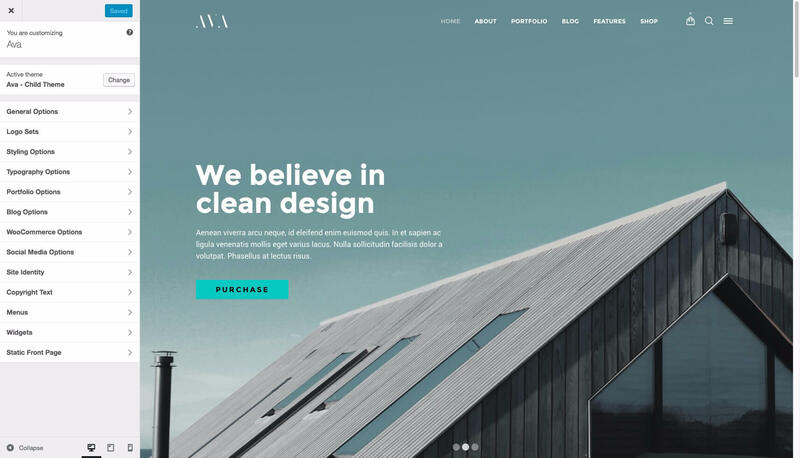 Ava uses the WordPress customizer to change the theme settings. This gives one the ability to see in the back-end what you are changing and how it looks on the front of your website. 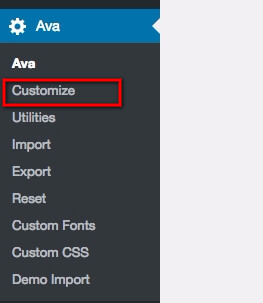 Through the WordPress Admin Area –> Appearance –> Customize menu option. In the customizer you can adjust all the design related theme settings and see the results on the preview screen right of the settings. Note : For some settings, a highlight area will be visible in the preview window only if that area is in the visible part of your screen. I could mean that you need to scroll the preview area to actually see the setting you are adjusting. In the customizer area, the theme settings can be adjusted for each section (group) of settings we created. For leaving exiting the Customizer click the [X] top left in the customizer window. Note : Unsaved settings are not stored and will be lost. When you are working in the customizer you might see a yellow flash indicator. When you click on the flash indicator the preview window will show you a flashing overlay indicating on which part of the screen you are adjusting the settings. If you do not see anything flashing that the area is not in the viewport and you need to scroll the right side of the customizer (the preview area) in order to see the indicator.